In preparation for relaunching into PhD studies, I am working on getting back into the habit of reading academic papers. Over the coming weeks, I hope to be reading more and writing more. Yesterday’s articles surrounded the very limited literature on the intersection of pathography and blogging. I found three articles: Lent (2009), Elperin (n.d.), and Vaccarella (2012). The short notes version of what I read are: (1) I don’t agree that blogging is a good medium for therapeutic writing unless the person doing the blogging has done reflection on blogging first, (2) pathographies seem to only account for those written in the form of books, there does not seem to be a consideration of blogs as a form of pathography, and (3) I wish I could do visual autopathography, but in reality, that isn’t where my skill set is. Lent (2009) “I suggest that if people have a personal computer and Internet access, blogging could be the next step in the evolution of journal writing.” (p.69). I found the article itself to be rather naive. Mostly my concern is that of encouraging patients who are vulnerable to write using a medium that makes them more vulnerable. This is a place for a course like Should I blog? Before encouraging anyone to blog, the potential bloggers should be encouraged to reflect on blogging as a practice, and be educated about digital identity and how much to share online. Lent (2009) suggests that blogging is a good tool for therapeutic journalling, but misses the most valuable aspect of blogging, and that is the formation of community that can happen when one truly engages in blogging. Perhaps it is this community aspect that differentiates a blog from an electronic journal? The website of pathographies is http://pathography.blogspot.com/. All of the pathographies listed are in the form of books – some self-published, others using traditional publishers. There doesn’t seem to be any mention of blogs as a form of pathography. I worry about how much of the story gets filtered when it is transposed into book format. I also wonder about the stories that don’t get told because only a select few have the skill to write their illness in autopathography book form. I wonder, are illness blogs a digital manifestation of pathography? 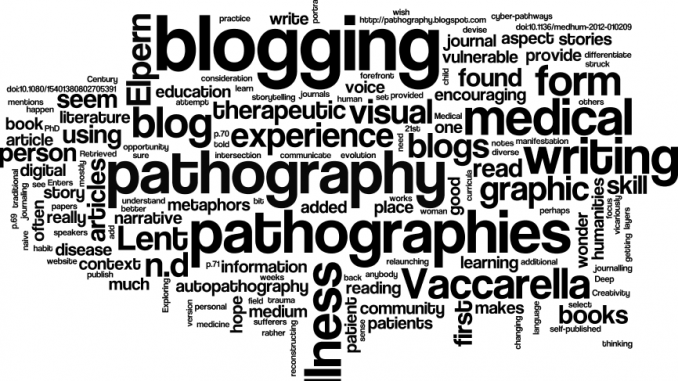 Is anybody writing about blogs as pathography? I really hope this is changing with the growing field of medical humanities. Vaccarella (2013) “The teaching of visual literacy skills in medical education curricula is still in its infancy” (p. 70). Vaccarella (2013) “When reconstructing their illness experience in narrative, patients often devise metaphors in an attempt to domesticate trauma and life change. Illness metaphors are frequently rendered in their literal sense ingraphic pathographies.” (p.70). This is the first article I’ve read on graphic pathographies. The author mentions the added layer of information that is provided by the visual context. It really makes me want to learn how to draw, so that I can tell my story in both pictures and writing. That being said, writing is the skill that I have, not drawing. I’m not sure I could add the additional layers of meaning, in part because I don’t see them when I read a comic. I’m not tuned into the added information that is portrayed using the visual media that are comics. The idea that graphic pathographies provide a better way to communicate with foreign language speakers is an interesting one. Rebecca been able only to skim over this but it’s relevant to my dealings with Alberta Health and their patient concerns staff. Finding my concerns around being reduced to an object are made worse by the need for the institution to “understand” me as “complaining” about some particular person’s bad behaviour rather than it being a system wide attitude that my person-hood is not relevant to my care. I’m currently engaged in conversation with a case worker and am hoping to get a chance to talk to a policy person about some simple changes. Of course my first inclination is to tell them to shove it and keep their bad habits but that won’t help. So I’ll read these links asap and send you some links via email on Narrative Pedagogy I’m finding is making me aware that not being treated as a whole person with more than a medical history has made my “care” very incomplete.